TS Model School TSMS Results 2019 – 6th, 7th, 8th, 9th,10th Admission Test Results, Merit list :TS Model School Results 2019 Download at telanganams.cgg.gov.in TSMS 2019 Download for Telangana Model School Admission Selection Test Hall Ticket 2019, TS Model School results merit list 2019 Download for 6th, 7th, 8th, 9th, 10th and Intermediate Entrance Test at http://telanganams.cgg.gov.in. TS Model School Results For 6th Admissions 2019 TSMS Result 2019 Download for TS Model School 6th Class Admission 2019 Selection list. Download 5th Class to 6th Class and Inter Entrance TS Model School 6th Results 2019 at telanganams.cgg.gov.in. TSMS CET Merit list/ Telangana Model Schools Selection list, AP Model Schools Entrance test Selection list. TS Model School 6th Results 2019 download @ telanganams.cgg.gov.in. Telangana Model Schools 6th Class admissions test Results for TS Model School Entrance Test 2019. AP Model Schools 6th Class Entrance Test 2019 Results / Telangana Model Schools VI Class Admission Test 2019 Selection list. Commissioner & Director of School Education, Telangana is is going to announce the TS Model School Results 2019 for Admission Selection Test from classes VI to X .The Telangana State Model School admission test appeared candidates can get results from here. According to the reports, more then 4 lacks of boys and girls are applied to the model school admission test and they need to download the TS Model School Hall Ticket 2019 to appear for admission selection test, as per the official notification distribution of hall ticket date is 1st April and examination date is 13th April through online from the official website of TSMS. This is very less time to download TSMS hall ticket 2019 and getting complete details about examination center details, every student who have applied for Telangana Model School Admission test 2019 they can follow the steps to download TSMS hall ticket with providing student submitted application number from TSMS portal. The Commissioner of School Education, Govt of Telangana released TS Model School Result 2019 for the Admission Test. The Commissioner and School Education Department officials issued the TS Model School 6th Class Entrance Test 2019/ TSMS CET 2019 Notification in the month of Janaury 2019 for admission into VI class in Telangana Model Schools for the academic year 2019-2020. As per the official Detailed Notification the admission selection test held on 13.04. 2019 (Saturday), Timings of Examination fr VI Class – 10.00 AM to 12.00 Noon and VII to X Classes – 2.00 PM to 4.00 PM and the examination test conducted with the time duration of 2 hours at all district headquarter city’s. Step 2: Click on the "Download VI Results/ Download VII-To-X Result"
Telangana State Model Schol Admission testresults 2019 is displayed on the screen with applied student photograph, class for apply, allotted exam center venue details and instructions of the test. Check carefully and click on print option to take a copy of printout and attend allotted test center with a valid ID proof along copy of the admit card. 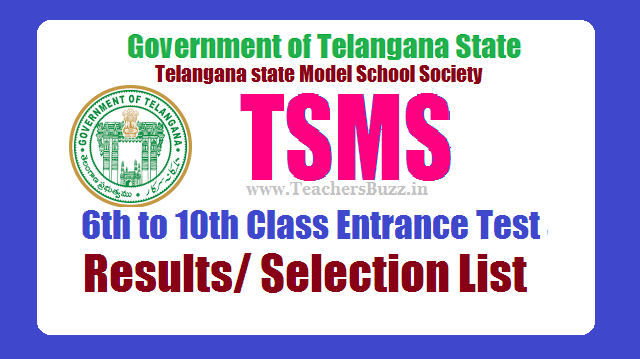 TSMS Results 2019 Telangana Model School CET Merit List download selected candidates list from telanganams.cgg.gov.in. The government of Telangana has been organized the exams for various classes in model school on particular dates that are mentioned on hall ticket. At present, all the students are showing eagerness to know TS Model School results which are captivated at the home page of a department. Entire applicants are required to keep safe their hall ticket no because with the help of this number they are having the chance to download TSMS Results 2019. It is navigated with the corresponding link on telanganams.cgg.gov.in website hence they should thoroughly check the details from it. With more preparation, they attempted the exam now waiting for TS Model School Merit List 2019 for 6th to 10th classes. This is an important sheet where all the students who are eligible for taking higher admissions will be displayed.